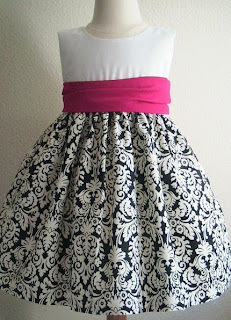 anyhoo...I am thrilled that tomorrow Cyndi and I are going for our serger lesson in the am. Hopefully, it's going to be a time saving machine! I really have no idea about it, except when we bought it, the lady said, "oh, it's really not bad when you get over the knife." At that moment Cyndi and I both had somewhat of a panicked look on our faces...if we are lucky, we will come home tomorrow with some new techniques and all of our phalanges(aka. fingers)! Oh, I did mention that today was the 100th day of school. 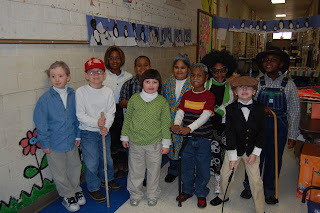 Here is a photo of most of my first grade class dressed as 100 year old people. They were completely adorable! I really do have some really sweet kiddos. 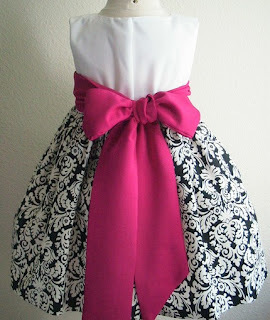 Oh, and Anne is going to be the flower girl in my cousin's wedding in March...We just bought the most precious flower girl dress off of etsy. I cannot wait 'til it gets here! Don't you think it will be precious? I am not sure what kind of shoes we need to wear yet...so if you have any suggestions, please share!!! 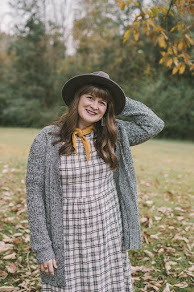 Well, I know this post has been really sporadic, but I guess that's what happens when I go a week without writing anything! Hope all is well, and I will hopefully post tomorrow to update about the serger!